So, I’m a little late for both check-ins. I have good reasons though. This was a rough work week with an hour drive to cover a shift at another store in the company. That’s an hour both ways, though the way home had traffic so it turned into an hour and a half drive. And I didn’t get stitching done there cause I don’t know how that manager would care about it should they find out. Then Thursday was my usual long, boring, snow-falling shift. Then Friday was a short day… but I went to see The Lego Batman Movie and not much got done. Honestly, that movie is wonderful and so worth the afternoon. Then Saturday was busy at work and Sunday I was just so close to finishing Joyful World February that I decided I’d wait and update you all today. And now that my rant is done, let’s talk about the updates shall we? Everything is related to WIPocalypse, but I’ll start with the Smalls update since it’s smaller. 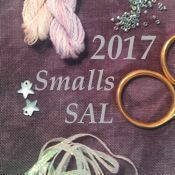 Smalls SAL is hosted by Stitching Lotus and challenges us to complete one small piece per month. I have been working on Birthstone Dragons and Rainbow SAL. Because why not combine things if you can? So, as usual, Birthstone Dragons dropped on the first of February and was greedy little Amethyst. Why is she greedy? Look at the way she hugs that jewel? She could be Gollum eying the Ring. Or maybe she’s about to eat it, and is examining it for nutritious value. I don’t know. It’s adorable all the same. She took me about four days to complete. That backstitching was extensive. But more on that further down. In short, I’m going to kit up for next month today (or get the list of threads I need to go buy… I weep for my poor destroyed February budget. It’s even worse than January.) And I can’t wait to get to get to March and the aquamarine. I’m betting it will be a sea dragon. So excited! Then I moved over to Rainbow SAL. I spent three days with the project, but the actual color and pattern pictured here only took me about seven hours over two days. Then I added more to the border and the motifs. 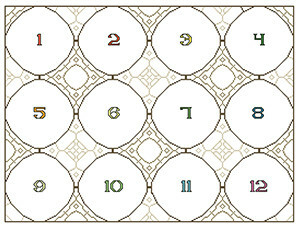 I actually questioned this pattern when I saw it. I definitely did not like it as much as January at first. However, as I stitched it, I began to really enjoy it. I love the color (DMC 722). March will hopefully drop on March 2 and I can work on it all day at work on Thursday. And that is all with my Smalls update. But all with the rest of them. Now we move onto WIPocalypse updates. 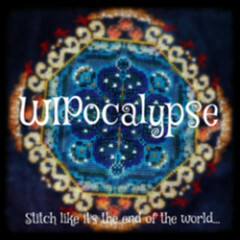 WIPocalypse is hosted by Melissa of Measi’s Musings and the challenge is to stitch as much as possible before the world ends. I have quite a few WIPs and this helps me get a bit more done in a month. I also use it as a sort of journal. I am doing four stitching SALs and working around these are a bit tricky. Birthstone Dragons and Rainbow usually start off the month. Then I do Cloudsfactory and Joyful World. I’ve already talked about this one last week. But I adore Marie Curie and was super glad to see her. And look at the beautiful swirls! I can’t wait to see who is coming next week and I’m excited to see which direction we go next as this large fabric gets filled in more! And I finished Joyful World-February late last night. I was just so close and I powered through it at 11pm. Since I finished with two days left in February I was tempted to start on March… but I’ll probably put it away and work on something else. I have a few projects I want to work on. Speaking of which, not one, but two other WIPs found their way into the light of day. Blitzen got a day of work this month, and he may get more. He now has a head. I replaced the DMC B5200 in his tail with Rainbow Gallery Wisper (I finally got some). Other than that, I’m really liking how he come is coming along. He really does go quickly. I get so much accomplished when I work on him. Even if its just one day a month. So there was some progress. Maybe I’ll work on this today. Because tomorrow, well… there’s a particular game coming out that may eat up most of my time. Maybe. We’ll see. Most likely though, it’ll eat up my time. And that is all I worked on this month. I’ll give you guys the rather depressing Stitch from Stash update tomorrow or Wednesday, whichever I get time to do it. It was pretty bad. But there’s always next month. What is your favorite stitch other than the standard cross stitch? I don’t like specialty stitches in general. I really enjoyed the eyelet stitch on Joyful World January though. But which one do I like the effect of? I have to say, as much as I complain about backstitching, it is really really really useful. I like the effect it has. As you can see here, the difference between pre-backstitch and backstitched is striking. It really helps to add definition to things. I love my HAEDs with their full crosses and no backstitching, but when backstitching is intended it really really works. And that’s all from me! Until next time! They were so much fun. So adorable. Beautiful progree on each of your projects. Amythest certainly has a crazed look!